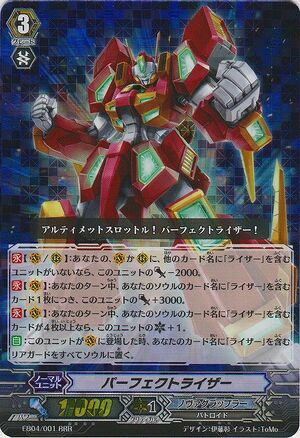 [CONT](VC/RC):If you do not have another vanguard or rear-guard with "Raizer" in its card name, this unit gets [Power]-2000. [CONT](VC):During your turn, this unit gets [Power]+3000 for each card with "Raizer" in its card name in your soul. [CONT](VC):During your turn, if the number of cards with "Raizer" in their card name in your soul is four or more, this unit gets [Critical]+1. [AUTO]:When this unit is placed on (VC), put all your rear-guards with "Raizer" in their card name into your soul. Which means he can absorb its rearguard too. similar to the majesty lord blaster. So whats the difference between him and MLB? MLB allows to choose a unit named "Blaster Blade", and a unit named "Blaster Dark" from your Rear-guard Circle, and put them into your soul] When this unit attacks, you may pay the cost. If you do, this unit gets Power +10000 until end of the Battle. This means it will only get the bonus 10k attack for the turn only whereas the Perfect raiser allows at least a +12k and may stack if you crossride it and abuse it again. Just imagine ya got at least 6 raizer in your soul, means +18k. To sum up. It will be 18k soul +11kbase + 8k boost = 37k vanguard with 2 criticals!! Assuming opponent controls a 11k vanguard, it will be 30k guard for 1pass and 40k for No pass which excludes the pressure from the rearguard. Not to forget this effect will goes on again on your turn. Below is rough decklist on how to build it. Hmm of all grade 3s why Mr Invincible? Why wouldn't put him? With your rapid soul charge capabilities and the need to have a huge soul, Why not. The deck do not use much of a counterblast as compared to the other decks, so why don't use it for a megablast? He can even use the megablast as a rearguard. With him around and an 8 soul, your perfect raizer would have drain the most from your opponent's hand with a kanzen or even 40k guard and a rearguard to drain a 10 -1k guard. So why not use him as a beatstick and pressure your opponent where he got so less to guard or nothing left to guard and use the megablast to stand all your units and go for a 2nd wave of attack and declare FINAL TURN! TODOMEDA! [AUTO](VC):At the beginning of your main phase, Soul Charge (1), choose a card from your damage zone, and turn it face up. [AUTO](VC/RC):[Soul Blast (8) & Counter Blast (5)] When this unit's attack hits, you may pay the cost. If you do, [Stand] all of your units.